Legendary American treasure hunter Mel Fisher searched for the wreck of the Nuestra Señora de Atocha for more than sixteen years. The Spanish galleon sank off the Florida Keys in 1622, loaded with precious metals, jewels, tobacco and other cargo. She and another ship from the Spanish fleet (the Santa Margarita), were driven by a hurricane onto a reef near a group of islands called the Dry Tortugas. 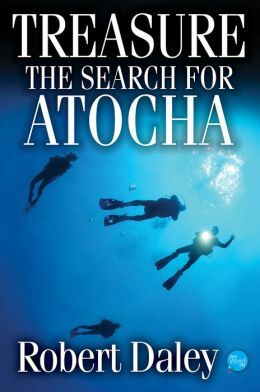 This is a fascinating account of a protracted treasure hunt for Atocha by a very determined man. Fisher had the requisite permits to search for and salvage the wreck (imagine that!) but was involved in numerous lawsuits for the duration of his search, and his financial state was insecure. He was constantly on the brink of bankruptcy. He had to continually raise money from investors and devise fund raising schemes in order to maintain the search. The search for Atocha was also marked by tragedy: during the years he spent looking for the wreck, a storm capsized one of his boats, killing his son and daughter in law, and one of his divers. The Florida Keys are a beguiling part of the world. Shallow, crystal clear blue water, white sands and several centuries of shipwrecks – many carrying treasure like Atocha – make this a paradise for treasure hunters and recreational divers alike. While the search for Atocha involved years of diving effort – thousands of underwater hours by many individuals – the key to finding the wreck was arguably provided by Dr Eugene Lyon. Lyon spent hours in the archives in Seville, Spain, searching for information to pinpoint the location of the wreck. The Spanish had found the wreck shortly after her sinking (the masts protruded from the water, which was less than 20 metres deep) and spent several years retrieving treasure from the wreck, so there were descriptions of her location (all tantalisingly vague). Fisher’s family are still cashing in on his legacy, and working the wreck. The part of the wreck with the most valuable cargo – the stern castle – has not yet been located. You can get a copy of the book here or here. There are many other books covering this topic – I don’t know how this one stacks up against the rest of them, so best do some research first if this is a subject that interests you. Robert Ballard takes us on a whirlwind tour of the deep ocean in this TED talk – from chemosynthetic organisms living at hydrothermal vents, to ancient shipwrecks, perfectly preserved in the Black Sea. 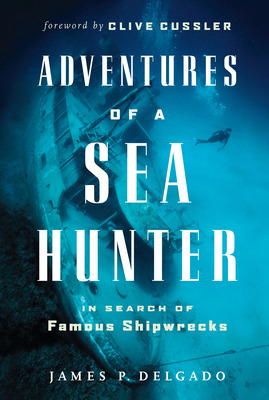 Ballard is the author of many books, the majority concerned with deep ocean exploration using remotely operated vehicles (ROVs): Adventures in Ocean Exploration, Mystery of the Ancient Seafarers, Return to Titanic, The Eternal Darkness, Explorations, Archaeological Oceanography, Graveyards of the Pacific. It’s not often that an article in the business pages dovetails with my interest in the ocean, but once in a long while there is a connection. 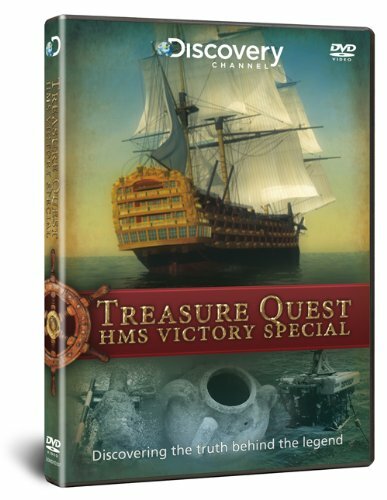 A 2012 Business Week article about Odyssey Marine Exploration, the company featured in Treasure Quest and the Treasure Quest – HMS Victory Special, relates the outcome of a protracted battle between Odyssey and the Spanish government over 17 tons of silver coins, retrieved from a shipwreck off the coast of Portugal. Odyssey spent $2.6 million retrieving the coins; the only compensation it received from the Spanish government was $20 apiece for the white plastic buckets in which the coins were transported to Spain. Yesterday’s article (written in 2008) describes in more detail the events that led to the conflict between Spain and Odyssey, and profiles both the company and its founder and CEO, Greg Stemm. Today’s one provides a good introduction to what the company does (if you’re not in the mood for a long New Yorker read), and fills in what happened since 2008 – and things did not turn out particularly well for Odyssey. The Odyssey share price (OMEX US Equity) hasn’t really gone anywhere since the company listed, which suggests to me that they still haven’t had their big break yet. That said, it must be remarkably interesting work, finding and researching long forgotten wrecks. Plundering them… not so much. 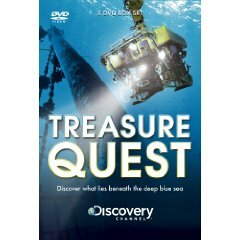 A lovely long read at the New Yorker, from 2008, describes an (then) incipent dispute between Odyssey Marine Exploration, the company featured in Treasure Quest and the Treasure Quest – HMS Victory Special, and the Spanish government, over a 17 ton haul of silver coins removed from a shipwreck located by Odyssey in the north Atlantic ocean. Odyssey engages in “commercial marine archaeology”, a practice that (rightly) makes many people uneasy. Odyssey is a listed company and aims to profit from sharing in the treasure retrieved from the wrecks it finds and plunders. They make use of ROVs and sophisticated sidescan sonar technology to sweep the ocean floor for potential targets. The company’s founder and CEO, Greg Stemm, is extensively profiled in this article. Until his retirement, Daniel Lenihan had a dream job, combining diving and archaeology, at the US National Park Service’s Submerged Resources Unit (formerly the Submerged Cultural Resources Unit or SCRU, and renamed in 1999 to include natural resources). He cut his teeth diving during the heydays of the sport, and became a skilled cave diver working with Sheck Exley in Florida in the 1960s and 70s, and deployed many of the principles of that sport when penetrating historical shipwrecks in the United States and around the world. Submerged, a memoir of Lenihan’s time in the National Parks Service, is a cracker of a book – Clive Cussler wishes he could write like this, and it isn’t even fiction. A competing volume (if you will), Adventures of a Sea Hunter, by James Delgado – a sometime colleague of Lenihan – covers some of the same ground, but with far less impact and immediacy. Lenihan is clearly a doer, and has the requisite ego and charisma to make things happen, even in a bureaucratic setting. The SCRU team dives and maps wrecks all over the world, from freezing, rough conditions in the Great Lakes in the United States, to a war grave in Pearl Harbour, Micronesia, the Aleutian Islands, and Bikini Atoll, where the US conducted multiple nuclear weapons tests. The chapter that made the greatest impression on me, however, was Lenihan’s account of a body retrieval that he and a buddy did of a diver who had gotten lost and drowned inside an old building that is now submerged in a dam. His account of diving in visibility measured in centimetres, trying to figure out where the diver could have gone in that confined, dark space, is riveting and terrifying. I was also very interested by the tests his team did on submerged motor vehicles, to determine how quickly a car fills up when it is driven into water. Lenihan himself drove a car into a dam, with scuba gear on the seat beside him, and his team attempted a rescue. Because of the air pockets in the vehicle, it was far less stable and much harder to access while submerged than the team initially expected. The toughness, rigour, safety awareness and innovation that the SCRU team brought to their work is marvellous to me, particularly as they were technically part of an arm of the US government. None of the arms of government are particularly effective in South Africa! This is a fascinating, wide-ranging read that will interest divers and those fascinated by history, particularly its relics that lie underwater. If you’re in South Africa you can get the book here, otherwise try here or here. For a kindle copy, go here. Last weekend we dived Sunday at Alpha Reef and it was really surgy and the viz not so great. It is odd that the visibility is so low given the amount of westerly wind we have had, but I suspect the very large swells that have accompanied the storms may have something to do with it. We then dived the wreck of the Brunswick where the visibility was a bit better, and finished off some Divemaster training. This weekend I am staying out of the water due to some scheduled maintenance but the glue should be dry by the end of next week… Luckily for you, if you want to dive, OMSAC are holding a Treasure Hunt, and you can join one of the boats going out on that day. There are also a few shore dives. We went two years ago and it was great fun. The event details are here. You need to book in advance if possible and it’s filled up quickly, so get to it. If you learned to dive with me and do find yourself on another dive boat, please do not use the words flippers or goggles. Too embarrassing. I would never be able to look that skipper and Divemaster in the eye again! You can go here for a Kindle copy, otherwise here or here for a paper book. The issue of protection for local shipwrecks has come to the fore in the last two weeks when it became apparent that huge quantities (18 tonnes of steel this week, much brass last week) of metal have been removed from the wreck of the SAS Pietermaritzburg which lies just a kilometre from Miller’s Point. 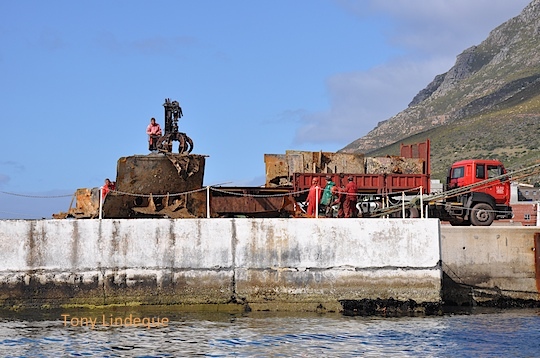 Divers are up in arms at the destruction of one of Cape Town’s most popular wreck dives, as are some who feel that because of the ship’s history, it should be left alone. 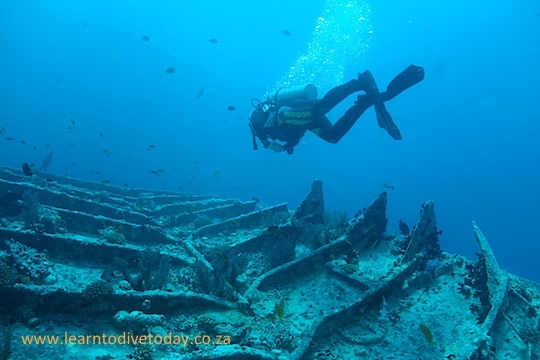 Shipwrecks in South Africa are protected under the National Heritage Resources Act (NHRA) of 1999. The act protects wrecks as archaeological sites, but only wrecks that are more than 60 years old. 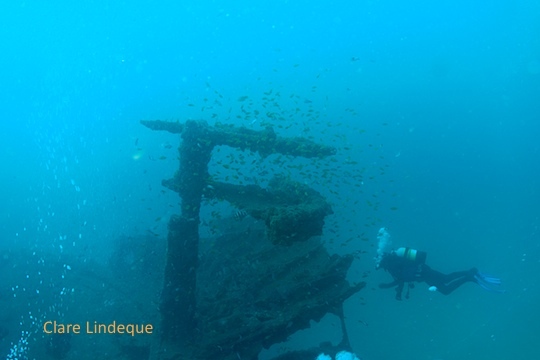 This would include a wreck like the SS Maori, but not a wreck as recent as the BOS 400 or any of the Smitswinkel Bay wrecks – or, unfortunately, the SAS Pietermaritzburg (the wreck is under 20 years old, even though the ship itself is over 60). d) bring onto or use at an archaeological or palaeontological site any excavation equipment or any equipment which assist in the detection or recovery of metals or archaeological and palaeontological material or objects, or use such equipment for the recovery of meteorites. The wikivoyage site on diving in South Africa has a useful summary. How does this apply to the Pietermaritzburg? The SAS Pietermaritzburg was scuttled in 1994, and is thus nowhere near 60 years old. These legal protections do not apply to it. This means that you will not face a fine or prison term for removing artefacts or other items from the vessel. I imagine that some kind of permit is required to perform the salvage that is currently taking place on the wreck, but unfortunately it looks as though this permit has been issued which allows the work to go ahead. 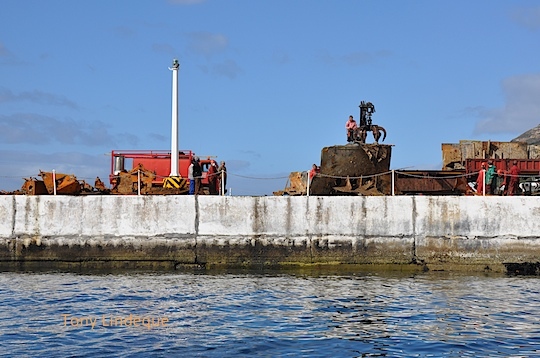 It has been brought to the attention of the Society and the Civic Association that a salvor has been cutting and recovering steel from the wreck of the SAS Pietermaritzburg. This ship was scuttled off Miller’s Point to act as an artificial reef. Apart from serving the South African Navy for many years the Pietermaritzburg, originally named HMS Pelorus, led the D-Day Invasion fleet on the 6th June 1944. Many feel that in the light of this ship’s history it should be left as is. In order for a provisional protection order to be placed on the wreck it requires a meeting to be held at which the public must express their desire in this respect. A meeting will therefore be held at the Simon’s Town Museum on Monday 30th July at 17h30 to which all interested parties are invited. Tony’s had this book for ages, and it’s been lying next to my side of the bed waiting for attention. When our house flooded in late June last year, it got a little bit damp, which moved it to the top of the pile (for drying, and, subsequently, for reading). I loved it! The book is edited by George Bass, one of the founders of the Institute of Nautical Archaeology, with several contributions from him. Bass founded the Institute in 1973, and has worked on shipwrecks all over the world, mainly ones within the range of recreational scuba divers. 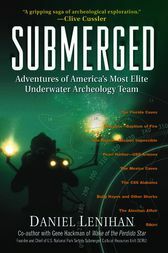 Robert Ballard, who specialises mainly in deep water archaeology, also contributes briefly to this book. It’s organised into sections by the time period of the vessel or historical site, and further into short chapters, amply illustrated with photographs from the field, of archaeologists and conservators at work, and of reconstructions of the vessels excavated. The chapter length is lovely because it enables the book to encompass a huge range of sites, and the photographs left me completely satisfied and delighted. I’ve been frustrated by the lack of photographic material in several of Robert Ballard’s books. Most of the sites dived are in the Mediterranean, but I was particularly struck by one of the Carribbean ones – Port Royal in Jamaica. In 1692 a massive earthquake caused a portion of the town – built on a sand spit, using rudimentary building techniques at best and dangerous short cuts at worst – to sink into the sea. It now lies in shallow water (less than 10 metres deep, it seems) and the buildings and their contents have been remarkably well preserved owing to near-anoxic conditions. The idea of scuba diving in a sunken city is quite engaging! 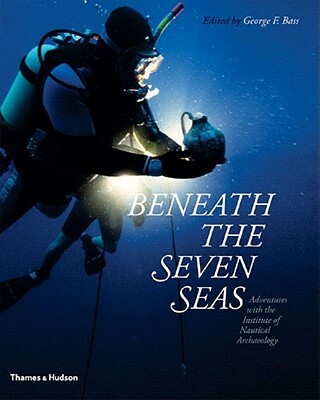 Something that emerges strongly from this book is the essential work done in conserving and interpreting the artifacts after they have been retrieved from the seabed (or wherever their resting place is). Estimates by the INA are that two years of conservation are required for every month of diving – it can take years to stabilise and treat a large shipwreck, and a long view of things is required to find fulfilment in this kind of work. This is the best nautical archaeology book I’ve read and is aimed at the lay reader (i.e. me). You can purchase it here if you are in South Africa, otherwise here.